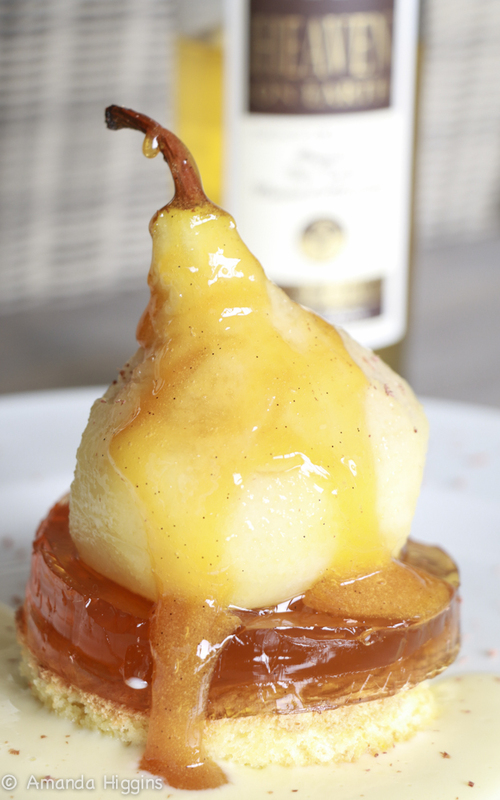 With winter here at last and the gorgeous Cape pears in season, this recipe popped into my head for the Ooh!Box. In this months box we received a delicious bottle of Heaven and Earth Organic Fair Trade Muscat d' Alexandrie - a natural sweet wine. It has the most wonderful scents and flavours of apricots and honey. I thought it would be perfect set as a jelly topped with pears. The poaching liquid is then reduced to form a sticky oozy caramel sauce, a marriage made in heaven! The base cake it gluten free, but is so light and easy who would want the wheat version anyway! This recipe was adapted from the Food and Home magazine. Pour the muscadel, water, sugar, vanilla and star anise into a saucepan over a medium heat. Place the pears in an upright position and cook till golden but not too soft: 15 – 20 minutes. Remove and set aside, keeping the poaching liquid. Line a 28 x 18cm cake tin with plastic wrap. Return the poaching liquid to the heat and reduce to 750ml of liquid. Mix the gelatin with the 60ml of water in a little bowl. Remove the spices from the poaching liquid. Add 500ml of the warm poaching liquid to the gelatine and mix until dissolved. Pour the liquid into the prepared the tray and place in the fridge for about 2 hours to set. Return the remaining poaching liquid to the heat and reduce until syrupy. Set aside to cool. For the custard, combine the milk and the spices in a saucepan over a low heat. As soon as the milk starts to simmer remove from the heat and leave to infuse for 20 minutes. Combine the egg yolks, sugar and cornflour in a large bowl. While stirring add half the spiced milk to the egg mixture and mix. Add the remaining milk and return to the heat. Cook for 2-3 minutes, strain through a sieve and set aside. Line and grease a Swiss roll tin 23 x 33cm. For the sponge, whisk the egg yolks and sugar together in a large bowl until thick and pale and the whisk leaves a trail in the batter. Fold in the ground almonds. Clean the whisk and beat the egg whites until they reach soft peaks. Fold this into the batter a little at a time being very careful to not beat the air out of the mix. Spoon this into the lined tin, very carefully, easing it into the corners. Bake in the oven for 15 – 20 minutes until it is golden brown and a skewer comes out clean. To serve: cut a circle of sponge and the same size circle of jelly. This is easier if using a cutter. You can however make the shapes into squares as well. Layer them on top of each other. Warm the pears in the microwave and place on top of the jelly. Drizzle the Muscadel reduction over this and serve with the warm spiced custard.